Canadian toads is a close relative specie to American toad, with which the interbreed since they share a similar distribution. Canadian toads, as their name suggest live in Canada, in Alberta, Saskatchewan and Manitoba and is one of the five frogs and toads species that can be found in the Northwest Territories. The hybrids born from those interbreed are recognizable by their intermediate characteristics and behaviours. Like the American toads, Canadian toad warts and parotid glands produce a toxin which is an effective deterrent for most of their predators. The toxins produce by Canadian toad causes irritation to the eyes and mouth and if it is ingested the predator is facing illness. 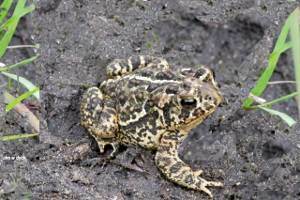 Canadian toads is a small specie of toads reaching 3 to 7.5 cm, male tend to be smaller the females. They have a black back marked on the with a yellowish median line and 2 to 3 rows of medium sized brown spots on each side. Each spot has one or a few tubercles in their center which are redder than the rest of the spots. In reason of their small size, Canadian toads feed mostly on small insects has ants, beetles, bees, wasps and also on small spiders. The Canadian toad is usually diurnal toad but can adopt nocturnal habit when the climate is hot. The specie is active from spring to fall and it hibernate by burrowing in earth for the winter. The Breeding period range from May to July after the end of hibernation. Canadian toad females lays around 6000 eggs each time for up to 20000 each year in long spiral strings of jelly at the bottom of the water. After 4 to 5 days the tadpoles start to appear and will need from 7 to 11 weeks to morph into little juveniles Canadian toads. Male reach their maturity after around a year while females needs two years..